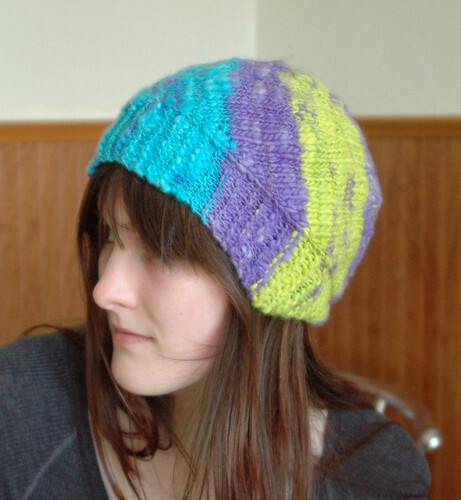 I've been meaning to knit this hat for ages, and I finally had some yarn that seemed destined for just such a project. I was a bit pleased when the construction turned out to be just what I thought it would be... it seemed to work in theory but I'd never actually tried it before. Hooray! I feel smart. 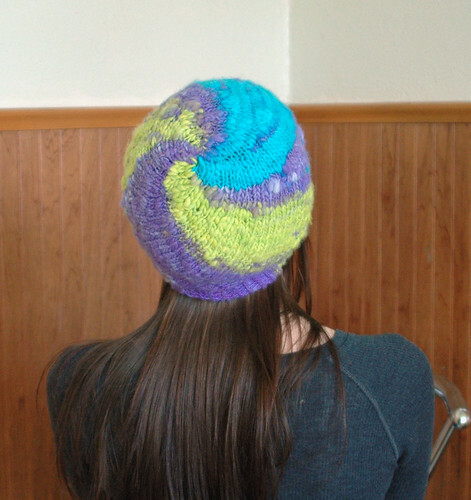 Pattern: Leethal's Spiraling Stripes Hat, the very first version in the pattern. Yarn: One of my handspuns from my brief participation in the Tour de Fleece. It's very lumpy.... too lumpy for my tastes, in some places, but I like it anyway. Mods: Bigger yarn, size 10 needles. I'm not entirely sure how many wedges I did... I just went til it fit around my head. I used the same cast on number, though, so it's a tad slouchy. Even so it actually fits tightly and is a nice thick fabric, and so should be much warmer than the majority of my hats. Yay! I also grafted it shut instead of doing a three needle bind-off, which would've been a good idea with any other yarn, but was sort of a nightmare with this stuff. I also made these goofy little wristwarmers with the leftovers....I will probably never wear them. Oh well. I have another Leethal hat pattern or two sitting around that I've been meaning to get to as well...I'm getting a bit sick of knitting with sock yarn so perhaps I'll take another break soon. I'm guessing that you had bad oysters, got food-poisioning, designed this scarf, and that's why you haven't been posting in a while! I think I saw you wearing the Bad Oyster at SS09! Um, I'm going to guess that it's called the Bad Oyster because knitting it caused you to miss an appointment in Stockholm? No? Ahh, well. It's very nice. I like the hat, too. And yes, I was wearing it on Friday at Sock Summit, so you probably did see me. Yay! I know! When an oyster goes bad, It closes, and the scarf looks like a closed oyster! And I said "Heeeeey, heey, hey, hey heeeyy..."
Bad Oyster - Pattern now up!